Dear Marie Curie (1867-1934): Though you are most famous for the discovery of the elements Radium and Polonium, and awarded the Noble Prize, few of us realize that your remarkable achievement heralded the dawning of the atomic universe. As a daughter in the learned and cultured Sklodowska family you took an unexpected path in science, so few women of your day would have considered. You were determined to succeed beyond expectations because like most young women of your day you were prohibited a higher education in your native Poland, then controlled by Russia. Your quest for an education, so plainly denied, would have deterred many other women but you took up the challenge even when it meant studying in secret. Circumventing this setback you would one day carve your destiny in science and also pave the way for other women physicists by giving them jobs in your own research institute. With only a dream and determination Marie Sklodowska planned to study at the Sorbonne in Paris but the problem remained that in order to prepare for university level course work there were no colleges open to women in Poland. So Marie attended science classes at a secret school for women called “the flying university,” so called because it did not have a campus and sessions were held in people’s homes in secret. Marie furthered her studies in physical science abetted by her cousin, Jozef Boguski, the director of the Warsaw Museum of Industry, who allowed her to do experiments in physics and chemistry on the weekends in the museum. Thus, Marie’s preparatory studies enabled her to attend the Sorbonne in Paris. In 1891 Marie Sklodowska, arrived in Paris with plans to study to become a teacher at the Sorbonne. All that changed when she met and married a dashing young physicist, Pierre Curie, who was by then a noted scientist. Together they began working on radiation experiments researching a mysterious, invisible energy discovered by Henri Becquerel a few years earlier. This radiation emitted from uranium atoms propelled Marie to the top of the physics profession. 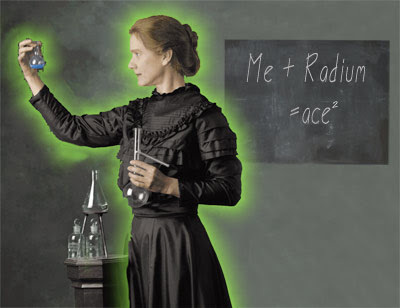 She discovered two new elements which the Curie’s named Radium (after “radiation”) and Polonium (after Poland). In 1903, the Curie’s and Becquerel shared the Nobel Prize for physics. The Curie’s close partnership was abruptly ended in 1906 when Pierre Curie was killed suddenly by a horse-drawn wagon and died. Marie stepped into his shoes and succeeded her husband as Head of the Physics Laboratory at the Sorbonne, becoming the first woman to teach there. Her prestigious position was challenged when a love affair with Paul Langevin, a close friend of Pierre’s was revealed in the newspapers. Marie’s reputation and career was nearly destroyed, but reinstated when she was awarded a second Nobel Prize in 1911. Marie always championed people who suffered discrimination and in her laboratory she made a point of particularly hiring women and gave them their start in physics. Among these early pioneering women was her own daughter, Irene, who she tutored at home. During WWI, Marie and Irene took X-rays of wounded soldiers which located bullets and shrapnel for the surgeons albeit an invaluable medical tool today. After the war she toured the United States and raised money for the Radium Institute. Irene married Frederic Joliot and continuing in the Curie tradition they were joint recipients of the Nobel Prize for Chemistry. THE BOLD ADVENTURE INTO THE ATOMIC UNIVERSE LOST ITS TOWERING FIGURE IN THE HISTORY OF CHEMISTRY WHEN MARIE CURIE SUCCUMBED TO THE LETHAL EFFECTS OF RADIATION EXPOSURE. SHE DIED IN PARIS IN 1934.